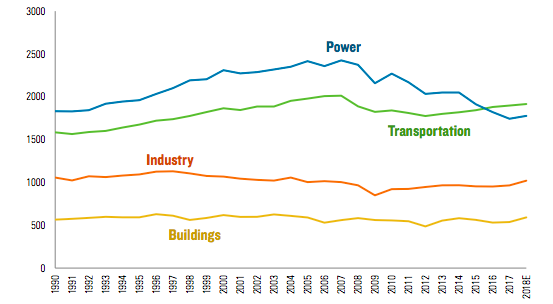 Each year, colleges and universities are ranked on sustainability efforts by various groups. Here are some of this year’s highlights. Powered by 100% renewable energy, SUNY Buffalo leads colleges and universities, and ranks #29 among all entities, including municipalities and corporations, according to EPA’s Green Power Partnership. 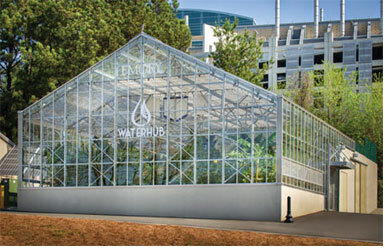 Emory University’s WaterHub® is winning awards for its novel approach for recycling two-thirds of campus wastewater. What looks like a lush greenhouse is actually the top of a wastewater treatment plant that processes 400,000 gallons of raw wastewater a day. Wastewater is filtered and circulated by plant roots and microbes munch on organic material. While typical wastewater plants are energy hogs, this one is powered by solar and the use of gravity. This natural approach is much less expensive, but it still requires funding. That too comes from an innovative model called a Water Purchase Agreement. A company called Sustainable Water is building the system at no cost to the university by taking its payments through water savings over the next 20 years. When fully built out, the WaterHub will be able to recycle 146 million gallons a year – about 40% of Emory’s water demand. Water isn’t just used in toilets and faucets, it’s the backbone of heating and cooling the campus. Each year, the Association for Advancement of Sustainability in Higher Education (AASHE) ranks universities. At Vermont’s Green Mountain College, sustainability is incorporated into all undergraduate and graduate programs, while Portland State (Oregon) and Dickinson College (Pennsylvania) get high marks for research related to sustainability. Sterling College, also in Vermont, ranks #1 for consuming locally grown, sustainable food. About 20% of food is grown on campus and 76% comes from local, humane sources. Synthetic fertilizers and pesticies are no longer used atUniversity of Colorado/ Boulder, replaced by organic fertilizers such as compost tea and removing weeds by hand. Sierra Clubs annual Cool School’s list is built on AASHE’s data, combining ratings in 11 areas from energy and water use to curriculum and investments. See the full list and what they are doing.